The disparity in the number of nations arrayed against the Central Powers was a common motif, and was updated as the numbers on each side increased. Italy's entry into the war on May 23, 1915 changed the numbers again. 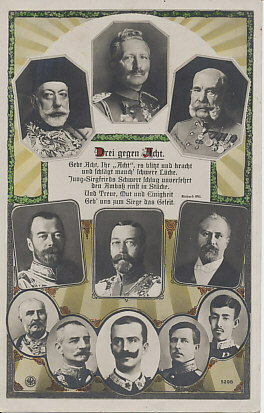 Central Powers (top) Sultan Mohammed V of Turkey, Kaiser Wilhelm II of Germany, Kaiser Franz Joseph of Austria-Hungary. 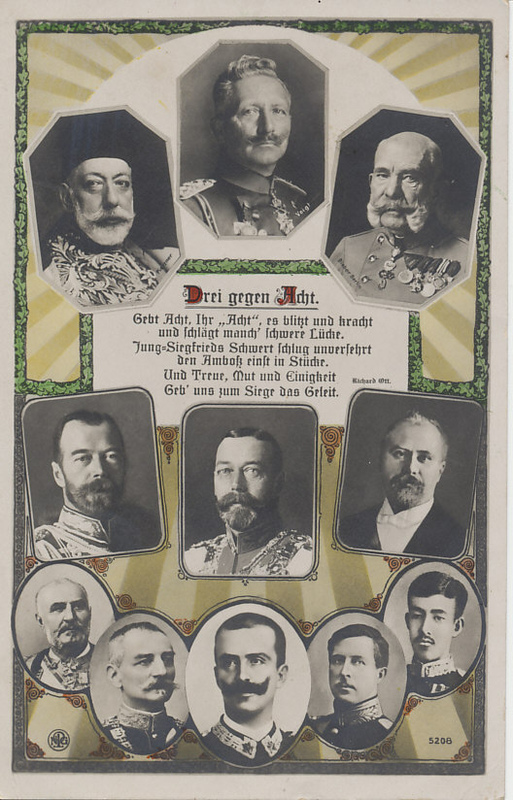 Allies (center and bottom rows) Tsar Nicholas II of Russia, King George V of the United Kingdom, President Raymond Poincaré of France, King Nikola of Montenegro, King Peter of Serbia, King Victor Emmanuel of Italy, King Albert I of Belgium, Emperor Taishō of Japan. 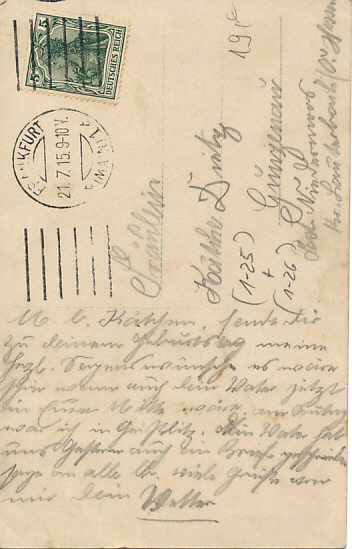 In the center, a poem: Drei gegen Acht, Three against Eight. und schlägt manch’ schwere Lücke. Den Ambosz einst in Stücke. Geb’ uns zum Siege das Geleit. And suggests some serious gap. Will lead us to victory. Mohammed V was Sultan of Turkey, ostensibly the Head of State. In 1908, the Young Turks had seized power, restored the Turkish Constitution of 1876, and limited the power of Sultan Abdul Hamid II. After attempting a counter-coup, Sultan Abdul Hamid was deposed in 1909, and replaced by his brother Mohammed V.
Throughout World War I, the Sultan Mohammed V was primarily a figurehead in a country increasingly ruled by War Minister Enver Pasha.